Kousei is a prodigy pianist and was the youngest pianist to win the Saki Competition but quit playing after the death of his mother resulted in his inability to hear the sounds of his own playing. Following the death of his mother, he lived two years without playing the piano and saw the world through monotone colors, but this changed after meeting Kaori Miyazono, a beautiful young musician who pushed Kousei to his limits in an attempt to get his fingers back onto the piano keys. As a child, Kousei was obedient and calm. Due to his fear of his mother, Tsubaki was the only one to convince him to tag along in her adventures. Despite being afraid of her, Kousei loved his mother and played freely for her during a competition which angered her. Until later in the story, there are still traces of his mother's verbal and physical abuse that linger in his psyche. Whenever he thought about his piano days, a darkened image of his sick mother would often appear similar to that of a post-traumatic stress disorder (PTSD) attack. His last performance following the death of his mother traumatized him to the extent of leaving him unable to hear himself play. Despite being unable to play piano, music was omnipresent in his life as he would spend his lunch breaks composing. Despite having friends like Watari and Tsubaki, Kousei spends most of his day alone in his thoughts. This dense characteristic makes him a little oblivious to what is going on around him. For instance, he does not notice the resentment his fellow piano competitors had for him nor Tsubaki's crush on him. He also stares at Kaori for long, awkward periods thinking how great of a person she is which she misinterprets as him having perverted thoughts of her. Kousei admires Kaori because she is his opposite; he wishes to become more free-spirited like her. The closer Kousei and Kaori get, the more his feelings for her deepen and the more he opens up to other people. She helps him build his confidence and convinces him to perform again. Kousei became a piano player at the request of his mother's friend, Hiroko Seto, after Kousei perfectly recreated an improvised song that Hiroko was playing in frustration towards her husband. This led to his mother becoming his piano mentor and teaching him how to play. Following a collapse in his mother's health, Kousei's style of learning to play the piano was drastically changed, as his mother began beating him until he could perfectly play a song based on how it was written in the score. As a result, Kousei started becoming distant from his friends and focused solely on perfecting his piano skills in an attempt to satisfy his mother and make her happy. 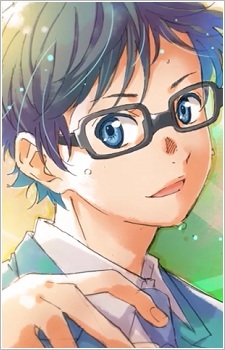 Kousei was then entered into a number of competitions, in which he stunned the audience with his perfect playing and attained the title "The Human Metronome" and was often referred to as his mother's puppet due to Kousei's lack of free will and emotion. Following a winning performance at the Saiki Competition, Saki attacked Kousei and drew blood, causing an outrage amongst competition attendees, but mostly between Saki, Kousei, and Hiroko, with Kousei lashing out at his mother and stating how he wishes that she "would just die. Coincidentally, Saki passes away a few days later, with the two not having spoken at all between these events. Kousei, feeling guilty about his last words towards his mother and also missing her tremendously, gradually becomes tone deaf during a competition a few days later, breaking down and later hiding in a corner of a room in the concert hall to cry, with only the comfort given from Hiroko. He later gives up being a pianist due to his tone deafness.